In the a.m. I was able to get the 1/4″ SS all thread. 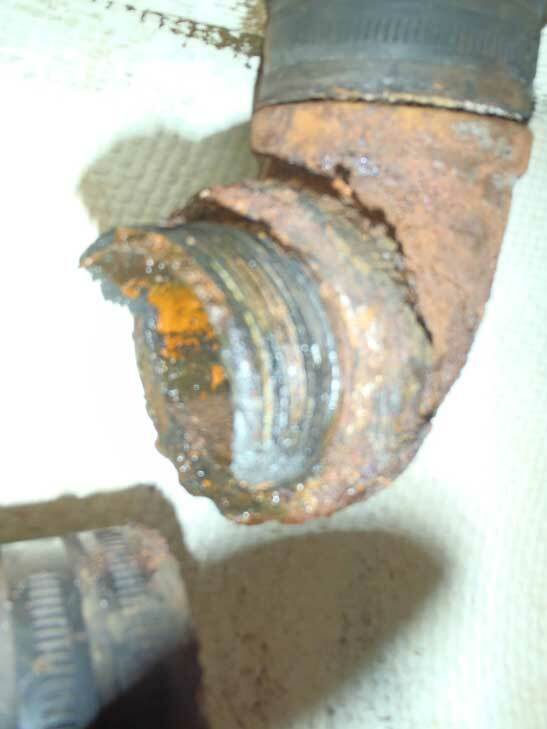 I also looked at replacing the strainers but the installation will be a little problematic. I had till 10:30 to decide as it takes me 30 minutes to walk to the store. I’m sure they wouldn’t close if I walked in a minute before and wanted to buy the $400 strainer. What I was waiting to see mostly was could I get the one I had repaired. I started by removing the broken studs. It was much easier than with the header tank. I do think they were brass studs because for the most part they crumbled. I drilled a good part of them out and then attempted to use the easy out again (smaller size). All that did was tear more of the stud out and I was concerned about tearing up the threads on the fitting so I stopped. Then I grabbed the tap to clean up the threads. Being cautious to make sure it starts correctly and doesn’t change any of the current threads I slowly worked it through the holes. Bingo. I tried the new all thread in each hole and they functioned properly. If worse came to worse I was going to drill through the holes so I could run the all thread through there and just nut the bottom. Fortunately I didn’t need to do that. With that done W/ set about to clean the bronze pieces. We heated up some Vinegar and dipped them in there. That wold get rid of any of the corrosion on them. 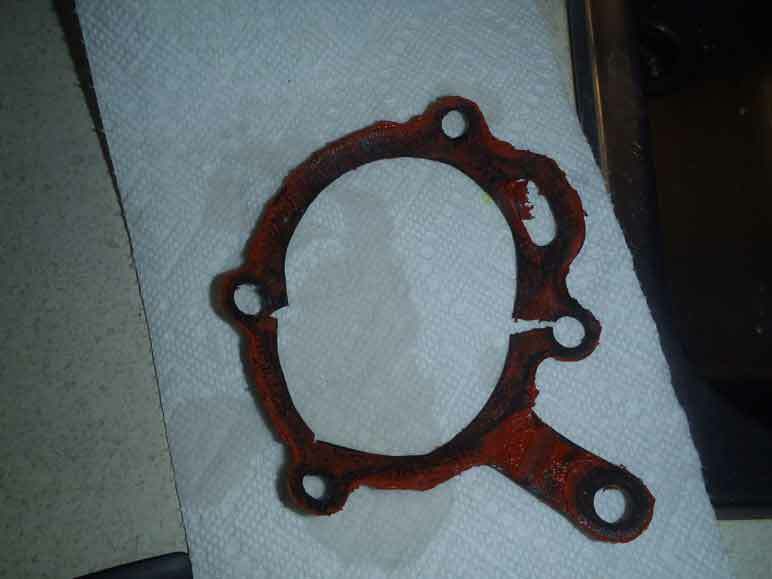 We also cleaned up the gasket (just in case I bought some rubber gasket material. With all that accomplished I was able to reinstall the strainer. I liberally doused the threads with Loctite and screwed them into the bottom bracket. I then put some Teflon tape on the drain nut and on the center toggle bolt carefully fitting both items. The top nut most always seems to leak so this time I tried a Cu washer thinking I would get it to seat. I had it all back together and opened up the seacock and removed the clamp on the hose to the dripless stuffing box. Water slowly entered the bowl, rose to the top and seeped out the center bolt seal. I take it back apart and find a rubber washer we had in the spares and use it in place. I reassemble it and tighten it back up; remove the clamp, open the seacock and bingo. A little water fills in and then it stops. In all this process I had checked my email and both my super people had given me hints. One was to check for a bleed screw on the coolant system (I can’t find it and there is only a place where I could have imagined one) and the other said to run it up with considerably more rpms. I ran it at 1500 rpms and it still was getting a bit too hot. We shut the engine down and waited a couple of hours. Then I ran it up to 2,000 rpms and the temp went to 180, then 190, then close to 200 and settled there. I checked the engine temps and the coolant tub and they were all within the good zone. As I came back out to the cockpit W/ said the temp was going back down. She settled at about 185 F. FANTASTIC! We are in business. We run it for about 30 more minutes and to be sure after we shut her down again and wait a couple of hours we run it again for an hour to make sure. It will take us about an hour to get to the anchorage and we don’t want any emergencies in the airport control zone nor the channel between the reef. It’s almost too good to be true. The temp rises up to 175 and stabilizes there. The book says the engine temp should be between 160 and 190. So we are on the money and in the money. We celebrate by W/ dragging me out to a Pearl shop she’s found something she likes. It doesn’t matter. I’m on cloud nine; after 14 days of working on this project we’re whole again. Boats not broke, and I’m not broke. People talk about sympathetic pregnancies; I have sympathetic boat symptoms. But no more. I’m whole again. Posted in Places, Restoration, Systems | Comments Off on Fingers Crossed….Success! Steve and Lili on Liward gave us the heads up on the bolts. Tony and Gail on Cetacea saved us with the thermostat. We were on a roll. We’ve walked a few miles chasing down small items we’ll need. We find the antifreeze that we want; well most of it, and we pick up the repaired header tank then continue our search for the hoses. While something is off and being serviced I want to replace as much of the older parts as I can with new. Hose is one item that eventually goes bad and if I replace it now I could very well put off having to remove the tank again for many, many years. We trek to the 4 places we figure that may stock the hose. After all, 1 1/2″ hot water hose is rather a standard; maybe in the US, but not here. Here the hose is considered 38 mm, not really standard. 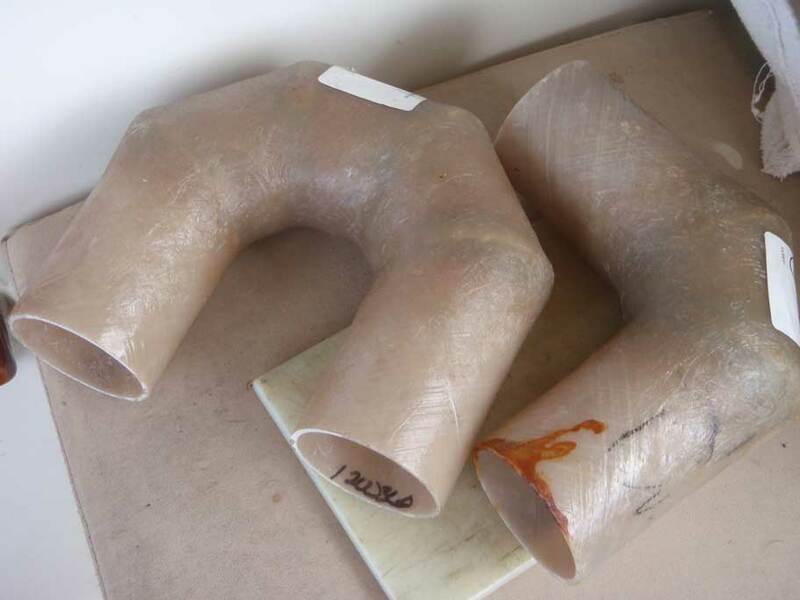 We find some 40 mm hose but even in a pinch that might be difficult to clamp and seal. And on we continue. 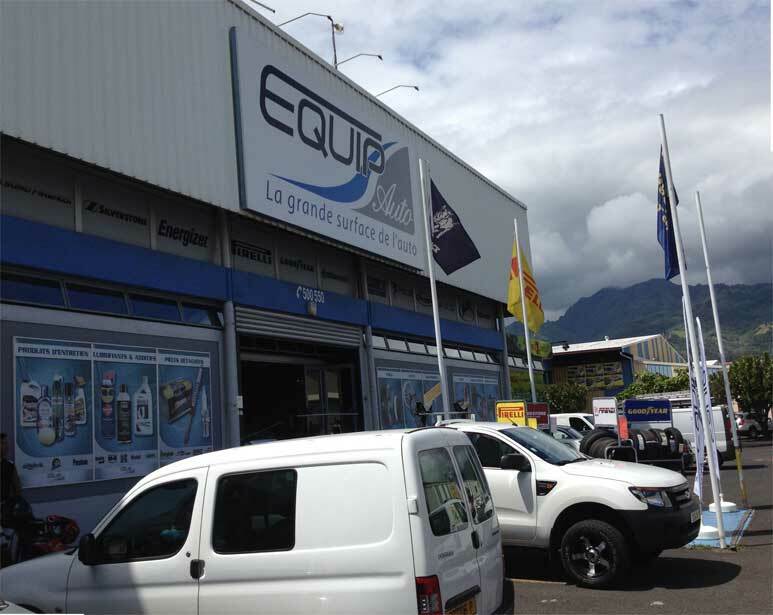 We strike out everywhere we look and I want to swing by Ocean 2000 Marine, what I now believe to be the best stocked marine store in Papeete. W/’s tired of following me around and although she loves to walk she finds traipsing through the side streets and striking out at each stop is not her idea of a joyful time in Tahiti. Truth be told it is not mine idea either but the bottom line is I’m too cheap to pay someone here who I can’t communicate well with and most likely wants an exhorbitant amount of money, then to beat all will do mainly what I am doing. I’m too cheap so I try to do it myself. And honestly, I trust doing it myself much more than letting someone else do it. I’ve found that often in the quest for expediency workers will take a short cut I never would, solving the temporary issue but leaving a lingering long term one time to develop. On our way back from the outer reaches of the marine world we cross the street leading out to Ocean 2000 and W/ decides since we’re this close to the store she’ll just walk another mile with me. 🙂 As we make our final approach to the store Steve and Lilli see us and swing by to give us a lift. 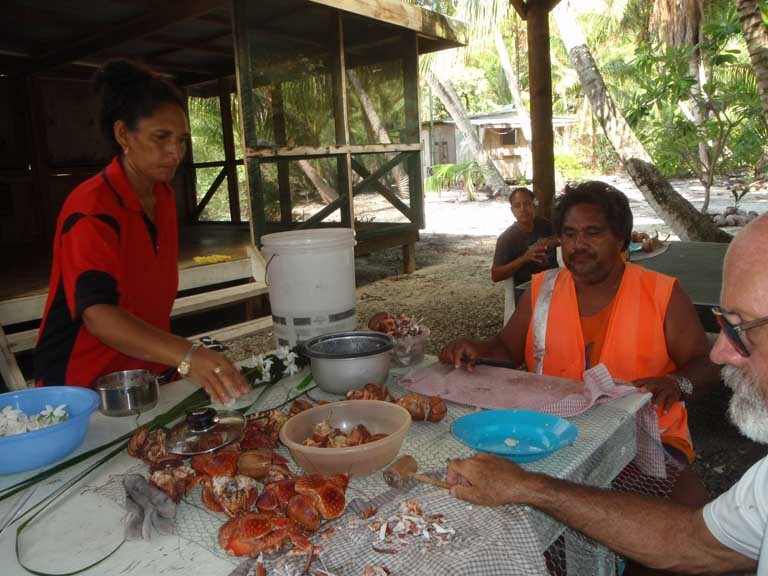 The had just returned from the outer islands and since they were hauling their boat in a month they had rented a car for a month. Just what the Dr. ordered, or should I say the boss; W/ . 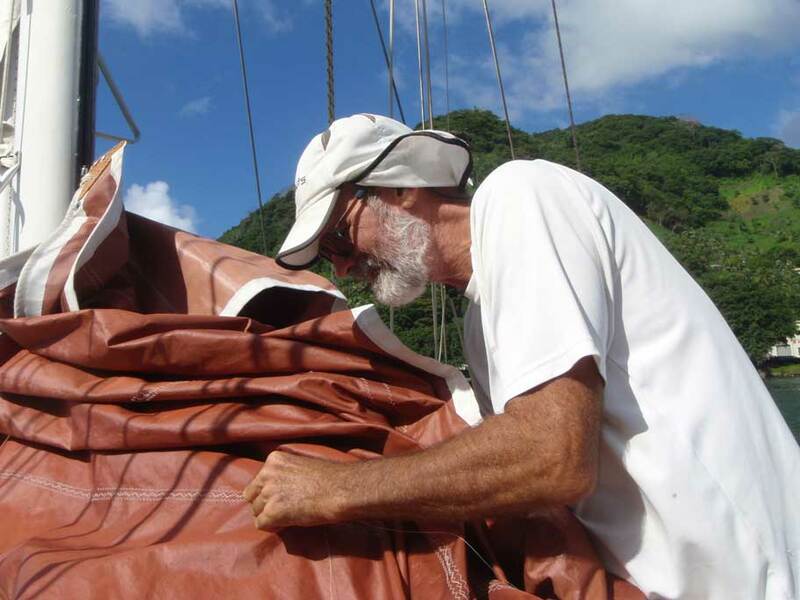 We chat with them; they’re struggling to get their bottom paint out of customs so they can have it applied when they haul their boat tomorrow, we tell them of our search for hose. Stopping at Ocean 2000; which they were just at, I wander in and ask about for the hose. Bingo! They have it, Sweet! Finally a little luck, maybe this will be our day. I pick up 1/2 meter of hose, more then enough to do what I need to do twice and off we go. We tell them to drop off where ever they need to turn as they are heading to customs for their bottom paint but they have none of that and drop us off at the gate to the boat. My quads thank them and we clean up at the boat getting ready for our afternoon adventure. Only two items left on the list; antifreeze and the thermostat. Today the buses are running and business’, were open. Yesterday the island was shut down; Sundays, not so much for worship although that may have had something to do with it but simply for a day of rest the majority of the island takes a break. Even the rowing shells are very few on Sundays. Monday is just the opposite. So much activity you would imagine the city has twice the population it does. But for us, Monday is a good day as restaurants are open and busses run. We catch the bus to Marina Taina to check Tony’s boat. Remember he said he had one thermostat on board but thought there were two, and since he was in the states and could replace it much easier than we could fly one here to just let him know what we could use it and take it. So we went to visit Cetacea. There I found them; exactly where he indicated, and he had…. FIVE. Wonderful ! We picked up 2 and emailed him to let him know and ask how much and how he wanted to be paid. Then I took some pictures of the boat that he had asked about and we had a wonderful lunch at the Pink Coconut. The Pink Coconut is where I was able to email him from as they have free wifi. Down to only one item; or so I thought. Antifreeze. I use a special antifreeze. NOT! After cleaning the cooling system completely in Panama we added Prestone Extended life. And since the common thought is to stay with the same liquids for your engine then that is what I wanted to do. Finding it wasn’t the easiest. While we were painting the parts for reinstalling W/ and I went on a walkabout……again. This time looking for antifreeze. I could find Volvo Antifreeze, Cummins antifreeze and some other “special” blends but even at the auto parts store where they had generic antifreeze I didn’t find the common Prestone we used. On a lark I checked the Mobil station; and besides – they have Magnum Ice Cream Bars :). Bingo! They had 2 gallons of Prestone Extended life. I need more but two gallons will be a start. I pick them up; at about $36/ gallon and off we go back to the boat to paint some more. The following day I begin the reassemble. I put the alternator belt and pulley back on. I clean up the surfaces the gasket touches. I run a tap through the holes that the bolts will go into. I vacuum the area for any small stuff that could get into the coolant system. I begin to reattach a hose I know not what it is for. Oh-Oh. I cut the hose off to remove it and here I find that it is a slightly odd size; 5/8″ and while I thought we had some on the boat we don’t. Time for another walkabout. W/’s not interested this time but instead chooses to get her hair cut; yeah she doesn’t trust me – go figure – 🙂 . Off one way she heads to the stylist and I head off again to; you guessed it, Ocean 2000; by now my favorite store. enter the store and right in front of me there is a display of at least a hundred gallons of extended life Prestone Antifreeze. Amazed; first I wander the store. They won’t sell out of the antifreeze while I’m here. They even had Odessey AGM batteries; which surprised me, there as well as a great supply of engine fluids. And all this was only a 100 meters from the Sin Tung Hing Marine store; which by the way we had asked about Prestone Antifreeze before and he never mentioned this place. Just amazing what is in one’s backyard sometimes and one doesn’t even know about it. Now with everything in hand; back to the boat I go for the final installation and testing. If I could have seen the future I’m not sure I would have been as excited. We……are……back! It feels like home. For the most part Panama is home. People say home is where the heart is and our hearts are with Elysium. Our hearts, a good part of our soul, a lot of our money, and much of our time have gone into Elysium. Roger picked us up at the airport and with another Spanish School student the 4 of use traveled into the city. W/ and I planned on spending two days repacking, getting organized and then returning to Shelter Bay and our baby who has been quietly sleeping away the time on the hard in the secure (sometimes locked) yard of the marina. We are starting to know the city well enough that getting around is not an issue. We almost know the real price of the taxi’s; not the gringo prices, we know where to walk and where to eat. no muddy puddles and no place to cool off in. We arrived and there she was, sitting now in the work yard with covers renewed and still in place. We set about moving into our new digs and planning our attack. Unpack, change and then open up Elysium and see what’s what. First things first, we noticed the painting we had contracted with Lyman Morse had NOT been completed. I wonder, what would Lyman Morse had done had they completed the painting and we didn’t fulfill our end of the contract? I wasn’t happy with most of the prices Lyman Morse had given us but the painting was one thing we felt was reasonable and we signed the contract in November before we left. Six months later Lyman Morse had not completed what was contracted for and had actually left Shelter Bay 2-3 months earlier. Good Riddance to Lyman Morse! I will do all I can to avoid having any further dealings with Lyman Morse. Should anyone reading this account choose to work with Lyman Morse all I can say is…. Good Luck! As far as Elysium goes; inside, she was a mess. Not that anything was destroyed but the last time we had visited her we simply put our gear aboard, replaced some awnings and left. Gear was everywhere. W/ set about to attempt some form of organization inside the boat while I removed the temporary awnings and installed our window air conditioner. Then we connected a water hose and began to wash away 6 months of boat yard dirt. Elysium begins her change from boat yard “a rag muffin” to the good lookin’ girl she is. Day two through launch we began the task of getting her ready to be in the water for another year or so. 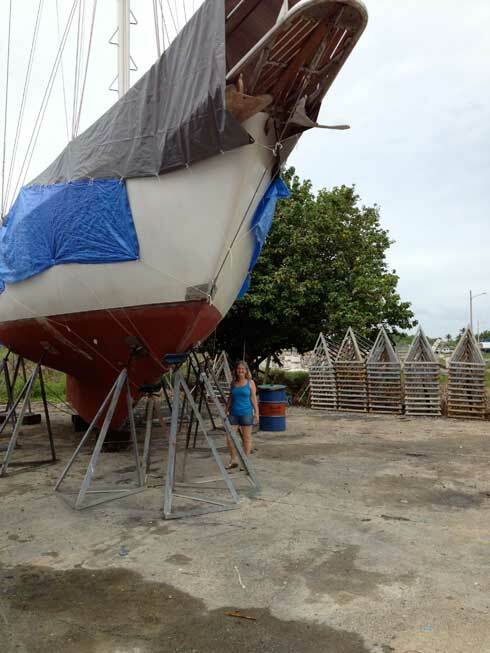 We spoke with Dave at the yard ( the new – old yard manager) and had the marina crew wax the hull, sand and paint the boat bottom. 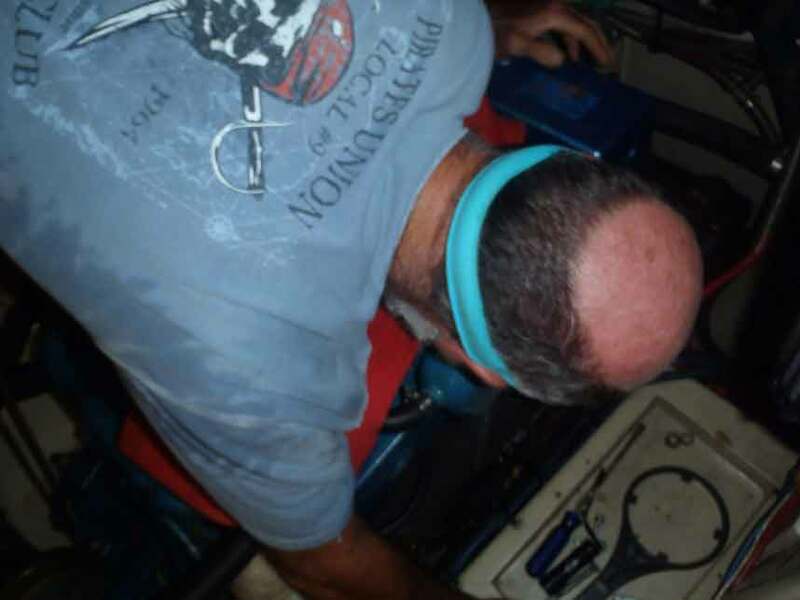 Not only are those tasks hard work they are jobs that if I can, I wish to avoid for the rest of my boating life. Besides, we have other work to do. 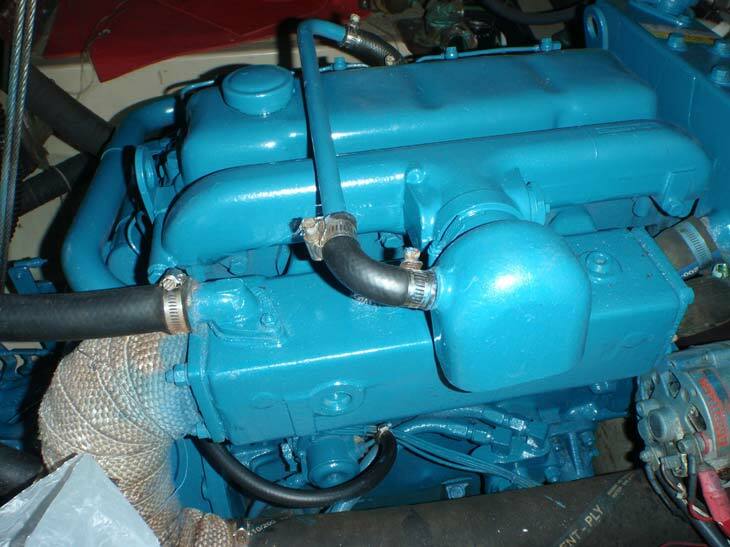 That being; lubricate all the thru hulls and replace the cockpit drain hose, replace the impeller and change – add the Speed Seal. And finally, clean, pack and organize so when she’s launched we can move back aboard. 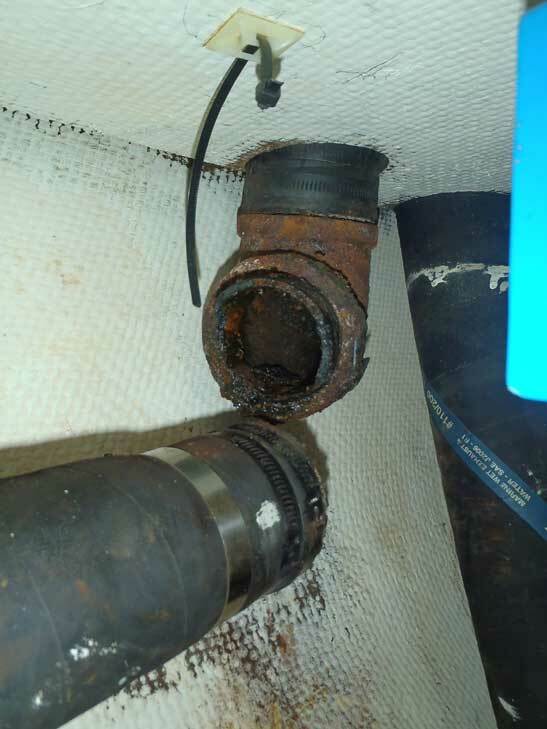 The cockpit drain hose was always 1″ too short and once while offshore I discovered that the hose had actually come off the scupper in the cockpit. Luckily we hadn’t any rain nor shipped any water so it having slipped off was only a nuisance and nothing serious. A little effort and luck with a hose clamp put the hose back in place; but always in the back of my mind I was concerned with it. We had purchased some new hose in Panama City and while the task of replacing the hose sounds simple, from start to finish took a good days work for both of us. 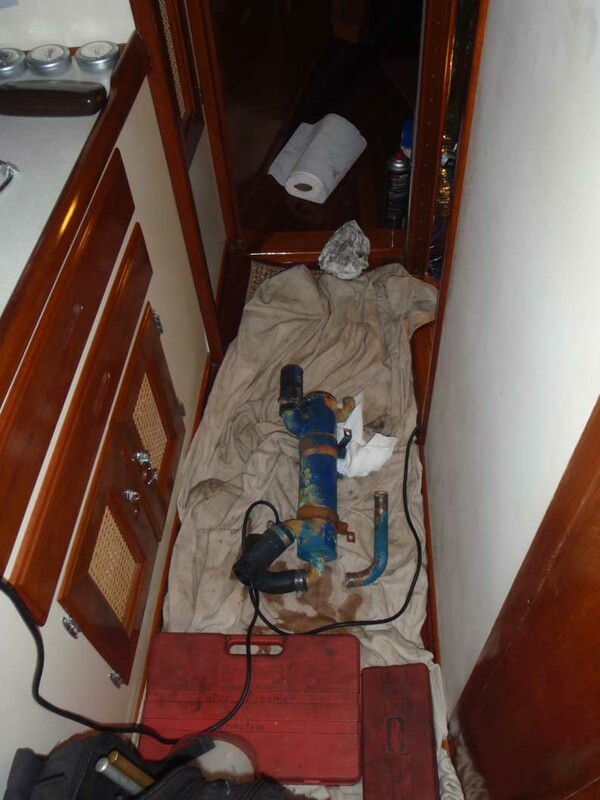 Removing a hose on a boat is one of the most difficult tasks aboard, even for professionals. In Galesville, MD; where we hauled a few years ago the yard manager told me that in a contest between a hose and an individual, most of the time the hose wins and it just needs to be cut away. Cutting some of the hose away I had planned on doing but I wasn’t interested in cutting every connection as at 5 bucks / foot here in Panama I hoped to reuse most of the hose for that section on the boat. I did end up needing to cut off one small piece but no problem, I had enough hose to replace that piece. Another day we spent on polishing the fuel that was in our tanks. We had set up a new system in the last year and now I needed to make sure all was working well. 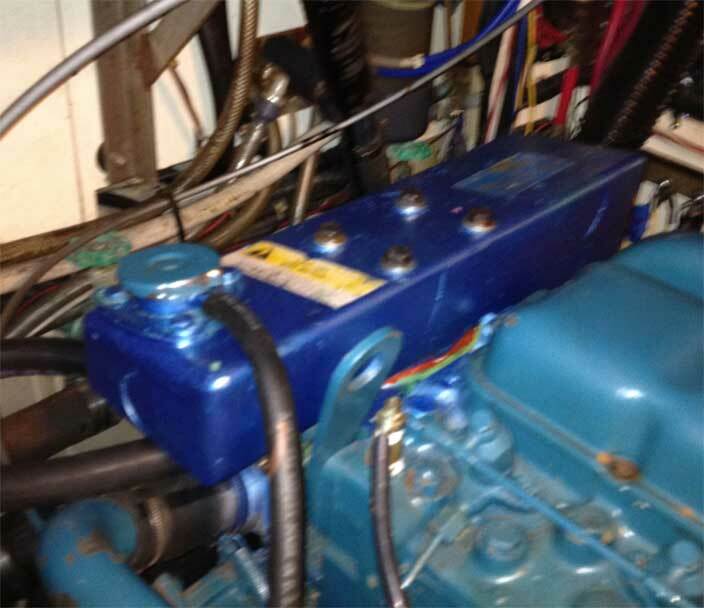 I had to do a little jury rigging because power to that area of the boat is re routed funny as the the generator and its wiring are still non functional. Finally fuel in both tanks has now been cleaned down to 2 microns (that’s the filter I have in the big Racor). While the pump was running I moved on to the raw water system. We replaced the impeller and I spent a good part of the morning looking for spare blades. I knew some were missing as if we ran the boat hard the temp gauge climbed up where it should not be. Thus on our last trip here we sailed some and idled the rest of the way. The tabs had found their way to the oil cooler and there I began to mine for them. I couldn’t see them but I could feel them in the entrance and with a bent needle nose pliers was able to extract most to them. But there were still three doing their damnedest to evade me. 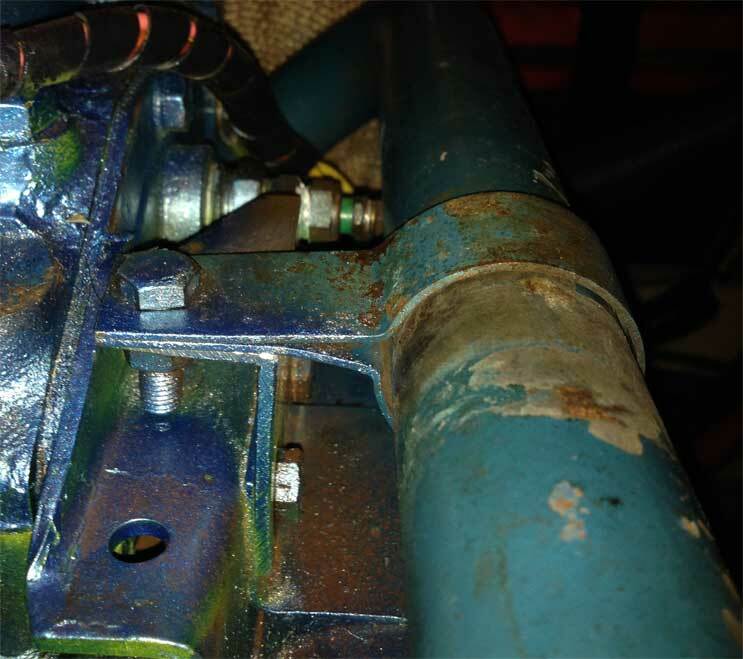 It seems that none of the marinized diesel engineers ever think to add a system for the catching of impeller blades so it was up to me to develop an ingenious way to gather the 3 blades still hiding. I tried tape stuck on the end of my finger but the water just didn’t want to stay out of the way. I tried tape on the end of a bent Cue Tip, and I tried small pieces of wire bend to grab those little suckers. Finally I remembered a sticky material we use with the coax cable , and stuck a bit on the end of my finger. I would gingerly reach into the space and hope to catch one of the pieces unsuspecting my lust for it, press down firmly on the piece and then slowly, every so slowly, remove my finger with the piece still sticking. After about 50 tries I had the final 3 pieces out of the cooler. That completed I reattached the hose and then we added a Speed Seal cover to the water pump. I’ll report on the Speed Seal at a later date. So one day spent working on the plumbing and 3 days of rain. Yep, we’re back in the rainy season again. We didn’t feel best about tracking mud back and forth on the boat and our yard crew working outside ended up short on time too. We expected to be in the water after one week. Maybe expected isn’t the right word but hope is. This haul out took 9 days. Not bad, not the best but within reason. We cleaned the prop and running gear, changed the engine zinc and made sure the systems (primarily propulsion) worked that we needed just to get Elysium to a slip. On launch day for some odd reason the yard started rushing us. Victor; the lift operator, told me just prior to breakfast that we would be launching later that day. After ordering breakfast he found me and said they were ready! I was a slave to the yard so I left my warm food to chill and followed Victor to the boat. There I disconnected the power and readied the boat to be trailered and travel the 100 yards to the lift for a final painting of the spots on the bottom the boat was sitting on and then slowly dropping her in the water. Why is it just about every yard in the world is slow as nails until they want to launch you, then they are in a hurry? The paint went on the bottom spots and then I wanted to wait at least an hour. We wanted the paint to have a chance to dry and for some reason yards don’t, and I figured a minimum of an hour. Also the yard demanded a pay slip showing our bill was current so off I went to the office to pay up and then hide. It only worked for a bit. Victor was in a hurry, being pushed a bit by Russ who is part owner and sometime yard manager. 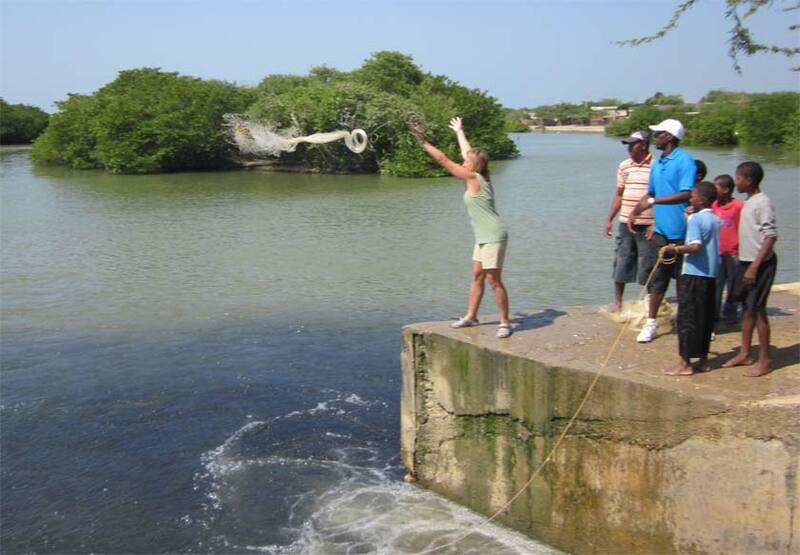 The boat was suspended about 1′ above the water, they waiting; not patiently, for the pay slip and to drop us in the water. As soon as she was wet I went aboard to check and make sure water was staying where it was suppose to; outside the boat, and then we could be on our way. It was here I discovered the reason why they were in a hurry. A catamaran was waiting a bit off the slip way to be hauled out. They were anxious to get us out of there so they could haul the cat. Feeding off their need for speed and knowing that we were not taking on water we started up the engine. I heard a funny noise looked over the side and saw the lifting strap immediately over the exhaust thru hull. As Victor lowered the straps and they pushed us out the funny sound went away and I believed all was now ok. Once clear the slip I again checked at the exhaust to make sure we had cooling wear. There was none! 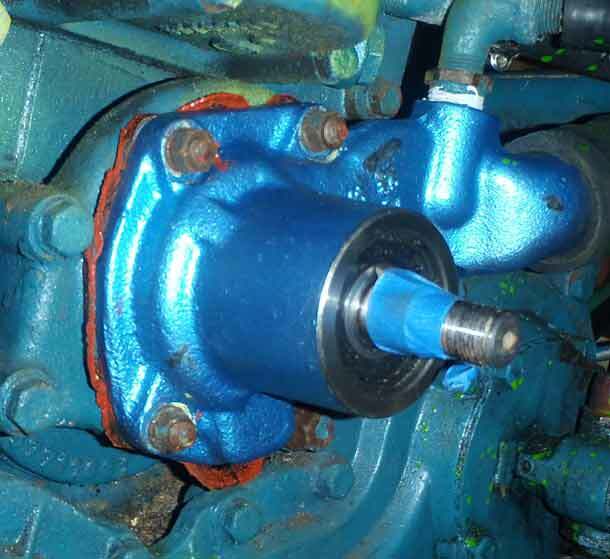 I ran below; remember we had just changed the impeller and added the Speed Seal. 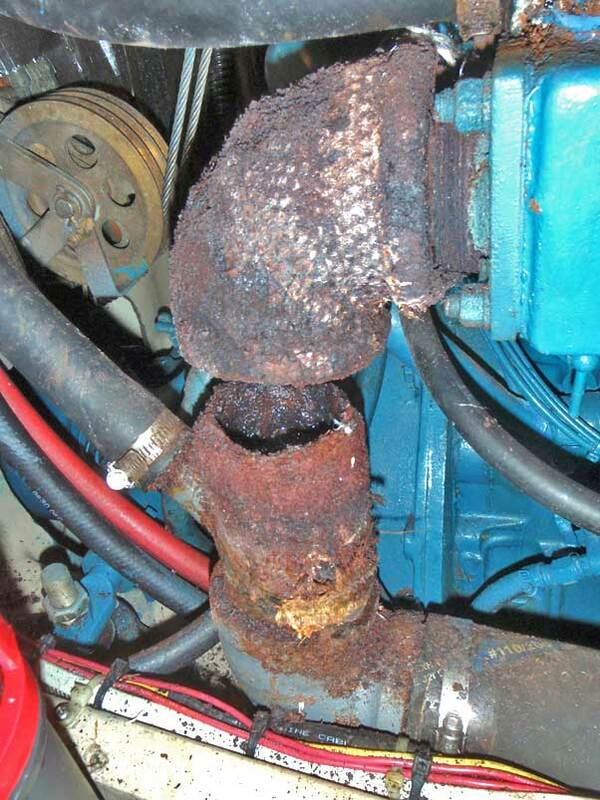 Luckily there was no leak at the water pump, unluckily there was smoke in the engine room and the engine pan was full of water. I hollered at W/ to head to the nearest dock. We had a problem. I asked her what the engine temp was and she indicated the gauges were normal. I didn’t know where the water was coming from and I didn’t know where the smoke was coming from. We opened the cockpit locker to let out smoke while I looked for the issue. We crept towards the dock and as soon as I could get a line to the shore W/ killed the engine. The boat was again secure but I wasn’t. begins to press the kill switch. I show her where the problem is at and shake the bottom half of the fitting. It is now completely separated held almost in place by the exhaust tape. I have no Idea if I blew it apart from the strap being over the exhaust or if the extra pressure simply moved the problem forward making it an issue today. The good news is that we didn’t have something like this occur in the middle of our canal transit because there the cost is roughly $1,000 US / hour for a tug to take you the rest of the way through, and in the pacific I just don’t know how I would have jury rigged a solution. 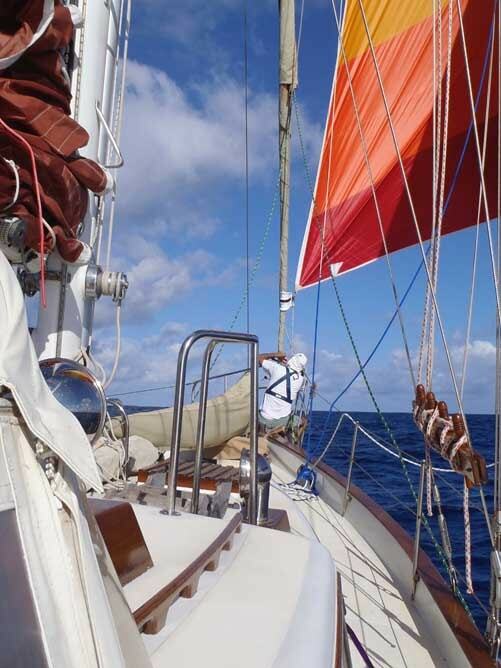 But here; at least we can get to a city and get parts, we have internet so I can contact Bud at World Cruiser Yachts and consult with my backups Mike and Dirk and Jack. For now we need to get to our slip. I go in search of John the marina manager who then takes me back to Victor the lift crew manager and arranges for me to be towed to our slip. Victor says in two hours and dummy me I figure two hours. W/ brings the rest of our gear down from the room and I anxiously wait. 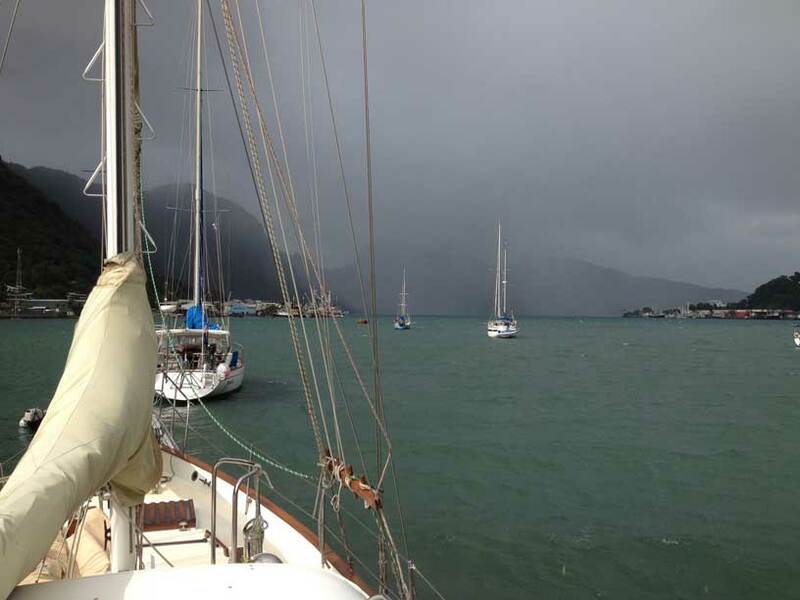 Four hours later the crew arrive with two dinghies and we are gently and uneventfully towed to our slip. New priority this week. 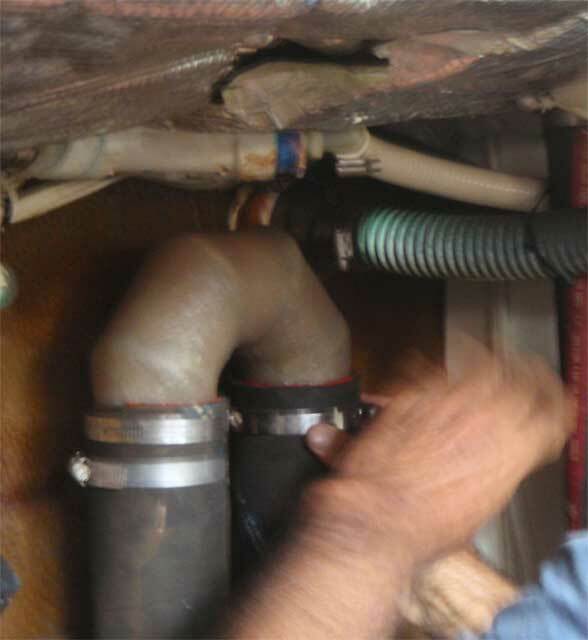 Get a new exhaust elbow mixing fitting and install it. Well we’ve been here over a week now. Settling in. We’re having “Elvis” paint the engine. We’ve walked the walled city. 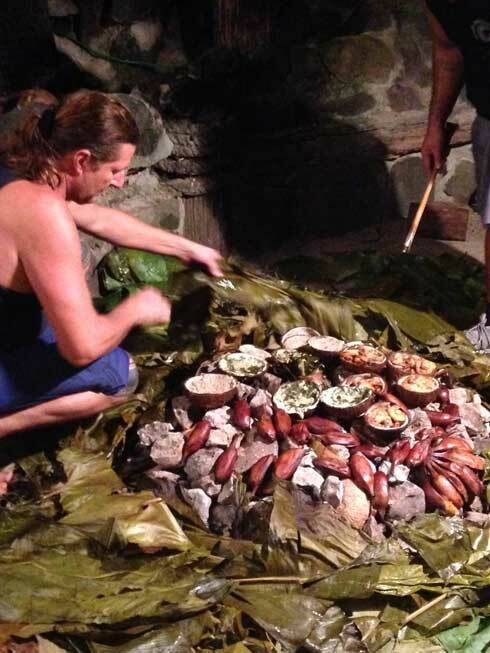 We’ve eaten at several restaurants, we have a scheduled for a Dermatologist and we went swimming in a Volcano. Well not really swimming. More like floating. Jeri on Peking organized a tour to the Volcano, $30 US / person and we signed up. We traveled in a new minivan (for me mini isn’t all it’s cracked up to be) and had Alex as an English speaking tour guide. We meandered through the city a bit with Alex telling us of various neighborhoods and how the growth has occurred and tidbits of the history of Colombia; political as well as long past. We went through a toll booth and even passed the first speed trap I’ve seen since in the US. Just as in the US, autos coming the other direction flashed their lights as a warning. Things that work just seem to be universal. 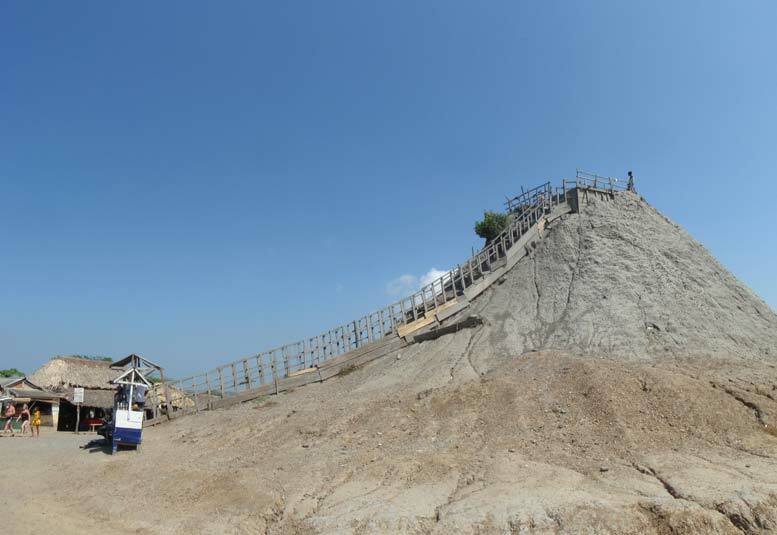 We turned off the highway and went up a road to the mud volcano. The road had just recently been paved and wasn’t yet finished. There we passed some small Tiendas and received instructions on the experience. were covered in the mud from people descending. Any moisture on the steps and they too were a bit slippery. At the top we watched as people entered the mud backwards and one of the massagers (people working in the bath’s for tips) laid you on your back and then slowly covered you with “MUD”. It wasn’t an unpleasant experience. The mud was slick and barely warm; most definitely not cold. Once covered from head to toe he massaged the legs, torso, face and arms (all in a couple of minutes – not nearly long enough) then he gently pushed you as you floated to another who rolled you over and massaged the back side. You could hang on to a wooden lattice work on the sides to keep your face out of the water. After a few more minutes you were rolled back over and he pushed your feet under you so you could hang upright in the mud. Hang is the best word to describe it. The mud had so much material that you floated about chest high. Just for fun I slowly tried to dunk W/ (she was aware of it) and I couldn’t get her shoulders below the surface. I kept rising out of the mud. One group of the tour, Fay, commented that she couldn’t seem to find the bottom! We all laughed at that as we had understood the bottom was over a 1,000 ft deep! All of us floated in the mud for about 30 minutes; slowly moving around, sometimes our body getting out of a vertical plane and then our feet would come floating to the surface. The best way to get upright was to have some assistance in pushing your legs back under you or balling up, and rotating slightly and getting your legs under you; then projecting them back down. As we began to exit we paused at the ledge and scraped the gobs of mud off of us and back into the Volcano. Of course as legend goes the bath is good for “curing” any skin issues you might have as well as removing years of age. Now I know I look 40 again! After being washed off by another in the fresh water lake we cooled off with some local drink and food. We tried their equivalent of the Egg McMuffin; without the Muffin, ( I wasn’t fond of this) and I had up a fruit salad which was IMHO; excellent (cost approx $2.25). Good Luck! Dark are is all fingerlings. and fishing. Megan and Becca (another two on the tour) tried their hand at throwing the net but they would have been on an extended diet if this would have been their life’s work as they both came up empty handed. This is one place the lake exits to the sea over a small dam and the fingerlings were so abundant here they literally turned the water black. The dark area in the photo is a mass of fingerlings. The larger fish come to feed on the smaller with the Colombian’s hoping to feed on the lager fish! Back at the boat we did what all good folk do at the end of a day’s work – we rested. An Artist; He moves, he lives! puppies as she led us through the “Walled City”. 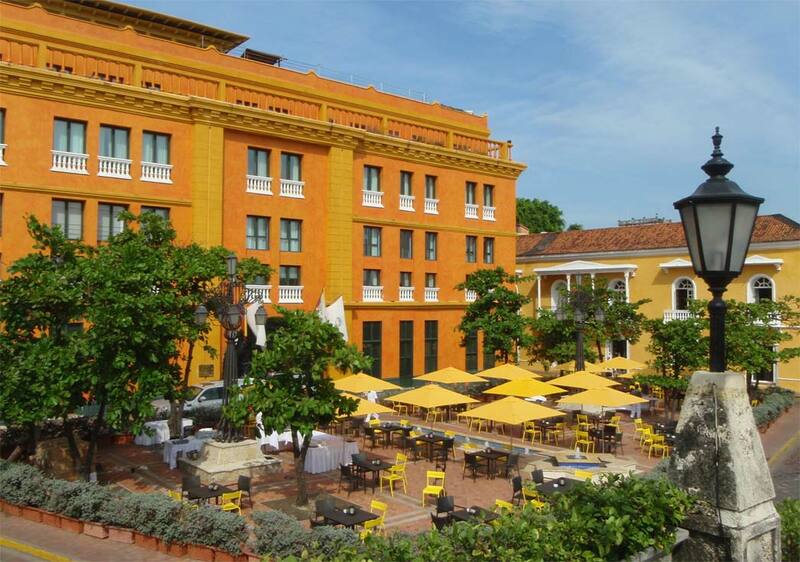 Once upon a time Cartagena had been referred to as the Stone Playground. Even though this was a tour we spent more time simply gawking as we walked through the city. 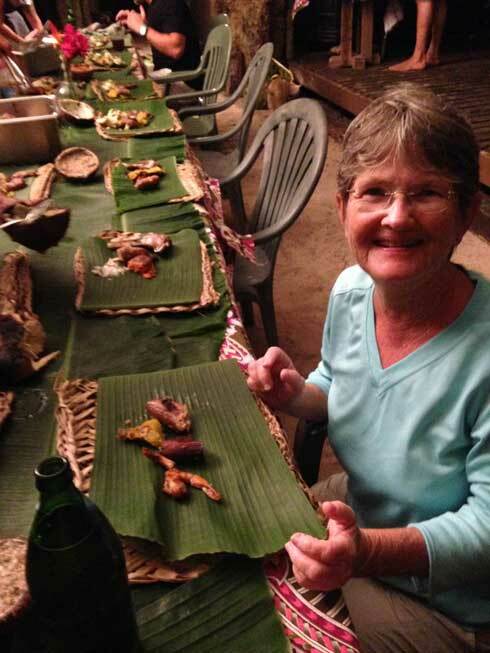 We tasted some of the local “sweet” fare that people were selling outside the courtyard, we toured the “Gold Museum”, we found a restaurant that had mostly locals eating in and thus we figured it would be good and reasonable! It was both. We ended another day totally exhausted and ready to count sheep. rust ( I wish they would have just used Ospho), primed the engine and then paint it. In the states they would have been hung by some branch of our government. 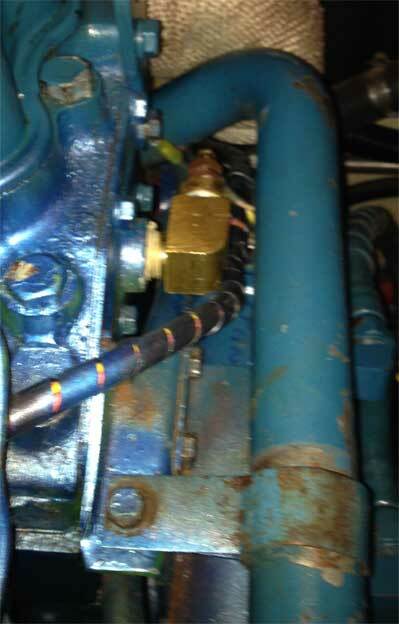 Elvis had a small low pressure paint sprayer that he had cut a hose off of the pressure end. Then he and Alfonso would exhale into the pressure end and “spray” the engine. Better them than me! They were able to complete this job in one day for 350,000 mills (about $220). What he said he couldn’t do was the bottom of the engine. Oh well. I know W/ and I can. We borrowed some Ospho from Passport, and then set about to paint the bottom. I first wiped off any oil, then wiped with mineral spirits, then put the Ospho on any rust areas. Two days later I rolled and brushed paint on all the ares they didn’t hit. 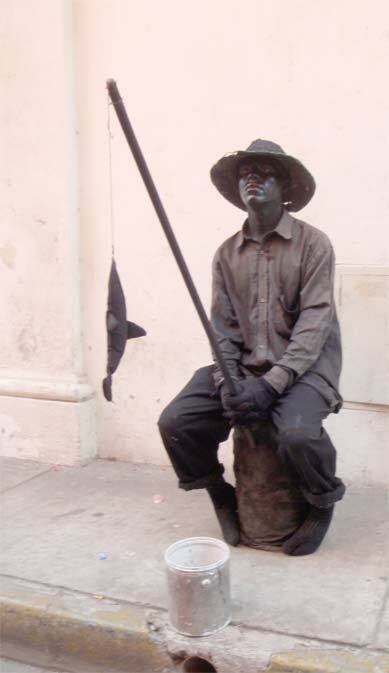 I had run out of the small amount of paint that Elvis had left so I had to buy some more from him. Oh well. At least now the engine looks “pretty”. Posted in Places, Systems | Comments Off on Cartag YEAH na!